- Rod Stewart; “Young Turks”. Torches are curious things both literally and figuratively. They burn. They are carried and passed on, serving as both honor and burden. They can conversely be inflammatory and inspirational. They burn brightly. They ebb. They die. They relight. In this sense, torches metaphorically speak to legacy. Given that this year marks the 50th anniversary of the “Star Trek” franchise, Star Trek Beyond is a celebratory cinematic torch, as all the above-referenced themes are touched upon narratively and metatextually, making for a filmmaking experience that poignantly homages what has come before while wholly coming into its own. 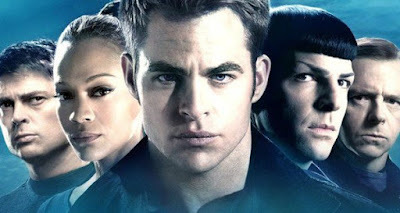 More than halfway through their first five year mission into unexplored space, both Captain James Tiberius Kirk (Chris Pine) and Mr. Spock (Zachary Quinto) find themselves (much like the franchise itself) at a crossroads. Thoughts of untaken roads and the burden of legacy weigh heavily upon their shoulders, leading them to reconsider their lives. Meanwhile, Starfleet intercepts a refugee named Kalara (Lydia Wilson) who requests its aid on a matter of utmost importance. Being the only ship in the quadrant with the capabilities to traverse the nebula she emerged from, the Enterprise is dispatched to assess the situation and render aid. Needless to say, things don’t go as planned, leaving Kirk and his intrepid crew, with the aid of an alien warrior named Jaylah (Sofia Boutella), to overcome practically insurmountable odds in a race against time to prevent the being known only as “Krall” (Idris Elba) from destroying the universe as they know it. 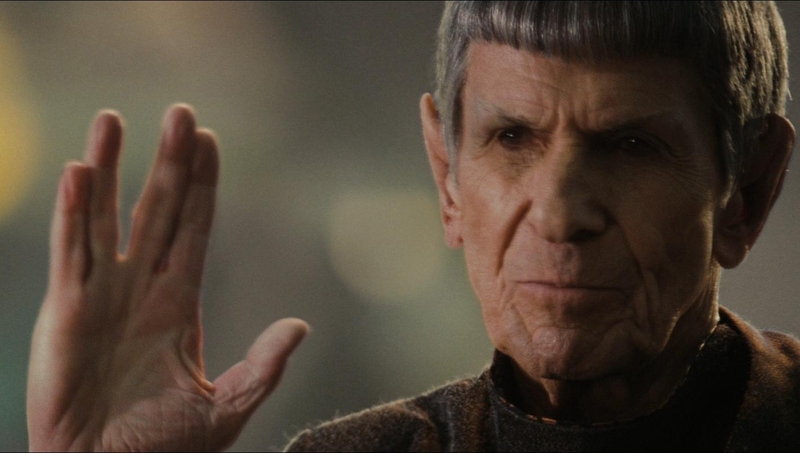 The previous film, Star Trek Into Darkness, left a bad taste among many, leading some to question its relevancy in the modern world. This idea being touched upon by Chris Pine in an interview wherein he stated that the current marketplace wouldn’t support a more traditionally cerebral take of the material. However, director Justin Lin brings his “fast and furious” penchant for speed and thrills while still retaining Trek’s spirit; a spirit encapsulated by the actors, most specifically by Simon Pegg, who co-wrote the screenplay with Dong Jung (along with some uncredited assist by Roberto Orci, Patrick McKay, and John D. Payne). The conceit of the prime universe’s events asserting itself in this new timeline is subtly revisited, as certain story beats and themes from the original films are echoed here. Unlike Into Darkness, where the trope was used for underwhelming and trite shock value, these changes integrally and organically drive the plot. Furthermore, there’s a comfortable tone the previous two films lacked: a feeling most epitomized by the Enterprise itself, whose interiors, despite maintaining its Apple Store aesthetic, seems more lived in, even homey. Speaking of visuals, it’s not hyperbole to state that the film is visually sumptuous, presenting a vibrancy at odds with, but still balancing, the film’s darker tone and themes. For those that say that Star Trek has run out of ideas, the VFX team certain science fiction concepts and visually give them a fresh retooling, which is most especially evident in the drone-like presentation of the enemy fleet. The visuals are so eye-popping and grand in scope, it’s a crime not to experience it in IMAX and/or 3-D.
Narratively, the film, no pun intended, engages. Without going into spoilers, one of Star Trek’s main strengths is serving as allegory for current, often controversial, issues, and Beyond carries on that tradition. Cultural and personal identity, personal relevance, life choice, past sins bearing bitter fruit, warfare, its aftermath, and their burning effects are all questions of consideration thematically; Beyond presents them in fast paced fashion. The script dots its “I”’s and crosses it’s “T”’s: Elements that are introduced are never unrealized. Further, the film holds your attention even throughout the quieter moments (especially when aided by the at turns bombastic and subtle score by Michael Giacchino, who without question provides his best score in this series to date). This leads to the other strength that Star Trek has: Characterization. 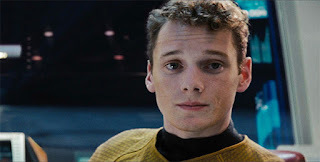 Pine, Quinto, Pegg (Montgomery Scott), Karl Urban (Dr. Leonard “Bones” McCoy), Zoe Saldana (Lieutenant Nyota Uhura), John Cho (Lieutenant Hikaru Sulu), and the late, and lamented, Anton Yelchin (Ensign Pavel Chekov) in the course of three films have transitioned from standard bearers to character embodiments for a new generation. Echoes of the original actors’ performances still remain, but the new cast shines, having made these roles their own, a fact this film cements. The script serves them well, as this time each character/actor is treated equally in terms of screen time and development. Most especially, despite rank, the characters respect each other, and the cast effectively convey a feeling of seasoned and hard earned camaraderie. Pine’s Kirk has made an interesting three-film turn from green rookie to seasoned commander. While still somewhat cocksure, Kirk’s maturity as both person and officer is evident, becoming more introspective and measured. Both Quinto and Urban are given much needed time to develop the humorous frienemy nature that typified Spock and McCoy. Pegg’s Scotty is still treated as comic relief, but at least here it’s not ludicrously contrived (“running gag”, anyone?). Cho’s Sulu is competency personified and, while the controversial nature of his character’s orientation tweak his been left on the cutting room floor, he nevertheless shows a softer, familial side that humanizes him further. Saldana’s Uhura, the most off model of all the characters (simply due to the socio-cultural climate and constraints original actor Nichelle Nichols had to contend with), is given the most leeway for character interpretation, and she more than makes Uhura hers. Special mention: Given the short shrift his character received in Into Darkness, Yelchin’s Chekov is given a meatier and more integral role in the proceedings, with his untimely death unintentionally adding poignancy to his effervescently vibrant performance, hinting at acting possibilities that can no longer be. Of the guest stars, cosplayers will find inspiration in Boutella’s Jaylah. Jaylah is fierce and deadly, but also imbued with a subtle vulnerability. Unrecognizable under tons of makeup, Idris Elba gives a menacing performance as the film’s heavy. His is a subversive performance, initially seems one-dimensional but it increases in complexity as the story progresses while still retaining a primal, vengeful edge. While the character's motivations could use more development, without equivocation his is one of the best villains the franchise has ever produced. Despite all its modern trappings, Star Trek Beyond is a worthy celebration of the franchise’s half-century existence. There is respect and reverence for what has come before, while embracing what it is and the promise of what can be. This film isn’t Star Wars-lite. It’s an action-packed film ride of an adventure and an immersive experience filled with action, pathos, levity, and moments of unexpected, emotionally moving poignancy. For those who question Trek’s relevancy, it is effectively and timely resonant, as all of best Trek tales are. The torch may have been cinematically passed eight years ago, but it’s proven to be held in comfortable hands and, if this film is any indication, stands to shine brightly for some time to come. Fantastic review! I feel like you have really captured the essence of this film through your words and your perception of the interesting characters and the roles they play.